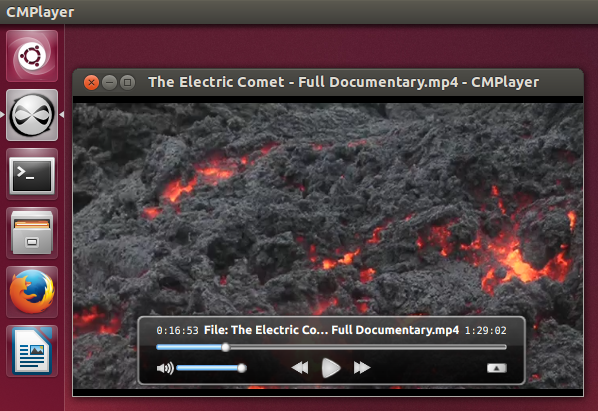 ‘CMPlayer’ is modern looking multimedia player for Ubuntu (and Mac OS X). 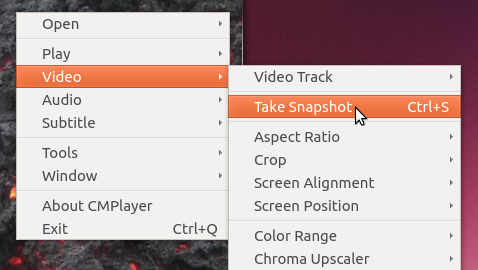 The user-interface is based on Qt 5x, and as you would notice from the below screenshot, it has minimalist & an intuitive appearance, though it still gives you access to a lot of (useful) settings, which is also why I thought of writing about it here. It comes with the GNU GPL (v2) license and mainly uses ‘FFmpeg’ (a collection of open-source libraries for handling multimedia content) and thus, the playback was very smooth on my Intel HD3000 GPU. ‘CMPlayer’ can play local files, URLs, DVDs, supports hardware acceleration (via ‘VA-API’), A-B repeat, playlist support (there is room for improvements here), lets you adjust a lot of Video, Audio and Subtitle oriented settings (Crop, Aspect Ratio, Color corrections, Deinterlace, Audio Sync, Volume Gain, Subtitle Alignment & Position, Delay etc), can ‘Resume’ playback from the last playback position, supports Drag n Drop, has a beautiful playback control window (transparent & floating), few built-in skins and more. If you are not satisfied with those, then you can use the ‘Preference’ window through which you can gain access to a huge number of additional settings such as changing the default ‘Cache’ size, Playback settings (enable/disable ‘Resuming’ & ‘Pause’ playback when minimized etc), Deinterlace settings, Fonts, Keyboard and Mouse shortcuts. These are again, just a few to mention!. 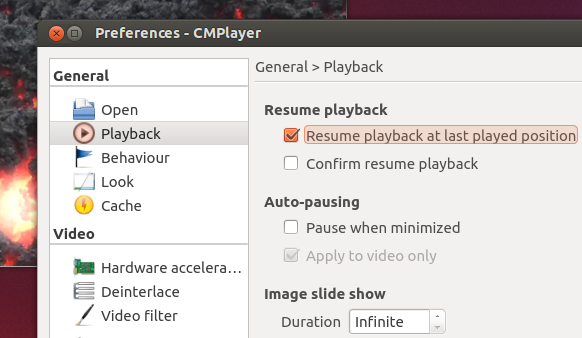 Though ‘CMPlayer’ is available for Ubuntu 13.10, 13.04, 12.10 & 12.04 through its PPA, only Ubuntu 13.10 users get to install the latest stable version it seems. Installing it on Ubuntu 13.10 is easy, but since it requires Qt 5x (which is not included by default), you will have to enable ‘Canonical’s Qt Edgers’ PPA, and enabling this PPA might trouble you (only) when upgrading (has nothing to do with updates) the operating system. Anyway, if you are ready, then open your terminal window and enter the below commands to install it. Well, as I mentioned earlier, since ‘CMPlayer’ is primarily based on ‘FFmpeg’, I did not encounter any playback issues and everything was very smooth. That said however, when playing an audio after finished playing a video (without closing ‘CMPlayer’) the playback window does not get ‘refreshed’ as it still shows the last played video frame (image) during the whole audio playback. Secondly, if I clicked on the progress-bar while ‘Paused’, although it seeks correctly to the preferred location, the ‘seek-time’ numbers get updated only when you ‘Resume’ the playback. These are the only issues that I came across and when all is said and done, they are minor issues. Hopefully they will be fixed in the future. 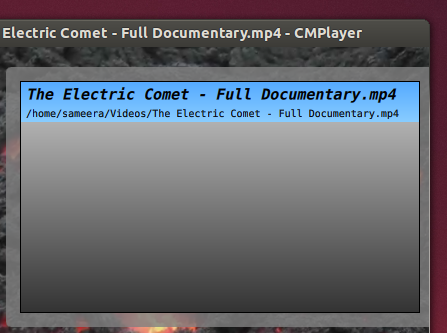 ‘CMPlayer’ is also available for other GNU/Linux distributions & Mac OS X. To learn more, please visit this page.